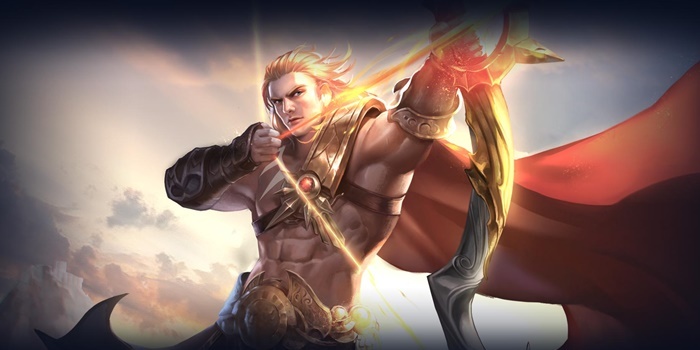 Hero guide to Arena of Valor's Yorn, The Hotshot. Despite his low movement, Yorn is a versatile hero, capable of high burst, sustained, and siege damage. Yorn is a purely offensive marksman who relies on both his basic attacks and damaging skills to deal large amounts of damage. His ultimate, Heart Shot, allows him to pick off fleeing enemies despite his low mobility. When built properly, Yorn has one of the highest DPS potentials in the game. Exceptional Damage – Through both his skills and basic attacks, Yorn is able to deal damage very quickly in order to eliminate his opponents. The quick strikes from Fierce Shot, in particular, are great for bursting away an enemy’s health. Strong Lane Control – Yorn can harass enemies and zone them away from their minions using both of his abilities without disturbing his own farming rate. Fierce Shot has a longer range than Yorn’s normal attacks as well, allowing for additional harrassment. Great at Pushing – Yorn is able to destroy both minion waves and towers very quickly. This can be a huge benefit in the path to siege the opponents’ base. Squishy – As is the case with most marksmen, Yorn has low defense and health which makes him an easy target for enemy attacks. Assassins in particular are huge threats to Yorn and can force him to play very defensively. Low Mobility – The downside to his large arsenal of offensive abilities is a lack in movement abilities. Yorn’s only option in bad situations is to run away or try and fight it out. Yorn needs to go to the Abyssal Dragon lane due to the safety that it provides. This will allow him some ability to farm minion waves and amass gold. Your biggest priority (outside of staying alive) is to amass as much gold as possible. Carries need a lot of expensive items to be properly effective, so focus your energy on getting as many last hits as possible. Play safe, only seriously attacking an enemy if they make a mistake and venture too far into your territory. The risk of losing gold while dead far outweighs the chance at a kill’s bounty. Despite a higher cooldown and lower damage scaling, we focus on leveling Heavenly Barrage first. Heavenly Barrage helps in tearing through minion waves and thereby accelerates Yorn’s growth. Furthermore, while higher in damage, Explosive Arrow is harder to hit with its narrow range and delayed strike. Those lacking practice with the odd ability will find it getting more mileage in team fights or when starting ganks. As with most heroes, take ranks in Heart Shot whenever possible. The additional damage it provides can be devastating and Yorn will always benefit from another way to instantly proc Fierce Shot. Solo Battles: Yorn needs to land his Explosive Arrow if he wants to fare well in one on one fights. Without any escapes or defenses, he will be incredibly weak to whoever can close the distance to him. Always follow up your skills with a normal attack, as each of Yorn’s skills will queue up a burst of arrows from his passive. As a result, chaining skills without peppering in auto attacks will lower his overall damage potential. Keep your distance from the enemy, backpedaling as they draw closer. You can continue to attack while moving by tapping the auto attack each time an attack is available. If the enemy retreats with low health, shoot your ultimate after them to secure the kill. Do not chase yourself if this fails or misses, just continue to farm and grow. Team Battle: Yorn needs to stay behind his allies so that he can safely deal damage without interruption. Watch for assassins who can use movement skills to jump towards you. Again, always be attacking after each ability use rather than chaining them out. Start off by targeting a support if they are in range, followed by damage dealing classes and saving tanks for last. Don’t be ashamed to step away from a fight for a moment when targeted by an enemy, but come back after your teammates have once again gained their attention. Escaping the Battle: Yorn lacks any movement skills, so will have to retreat on foot if things turn sour. His Explosive Arrow ability will help slow enemies and give him a bit of distance as he tries to run. Don’t stay at one area as much as possible when facing against Yorn. His abilities aheavily rely on positioning and require a ton of anticipation in order for them to hit. Avoid his skill shots by moving around or using mobility abilities. Avoid common recall points when Yorn is alive. If low on health, you will be an easy target to a mindful Yorn by recalling in predictable places. Fierce Shot – Passive – Each fifth attack triggers a burst of arrows, each one dealing 75 (6 per level) (+0.4 AD) ˀ physical damage. Fierce Shot arrows pierce, doing full damage to all enemies in a line. Fierce Shot deals damage four times. When dealing with on-hit effects, each arrow is considered a basic attack. This can lead to heavy life steal gains and high damage from damage-on-hit items. Items such as Omni Arms that enhance an attacks strength after a skill will only affect the first arrow in the burst. Skills will treat the next shot as the fifth no matter where the counter was before the skill. As such, it is more effective to use skills when the counter is low rather than when you were about to naturally gain an arrow burst. The counter will reset after one second if Yorn stops attacking. If it is filled, it will reset after five seconds of not attacking. Use the extra time to line up a favorable shot. All of the burst arrows affect towers, even when not directly targeting them. Yorn will fire a burst on his fifth shot, even if he does not hit an enemy with one of the preceding shots. If you know a fight is about to happen, it is possible to tap the attack button to bring the counter up to the fifth shot. This allows you to start a fight with your burst right away. Explosive Arrow – Yorn shoot an explosive arrow that deals 120/145/170/195/220/245 (+0.55 AD) physical damage to the enemies it hits and stuns the target for 0.75 seconds. His next normal attack becomes a burst shot. Explosive Arrow falls one second after being cast. Explosive Arrow does full damage to all enemies struck. As its casting range determines the center of the spell, it is possible to hit enemies slightly outside the apparent range. Heavenly Barrage – Yorn calls down celestial arrows that deal 105/120/135/150/165/180 (+0.4 AD) physical damage to a random enemy in the zone every second. Also, his next normal attack becomes a burst shot. Heavenly Barrage and Fierce Shot together allows Yorn to eliminate waves of minions incredibly quickly. Try to shoot Heavenly Barrage as to travel with your opponent as they try to escape. While not directly afflicting any crowd control effects, the clear presence of danger can do much in directing your enemy’s movements. Heart Shot – Yorn shoots an arrow that travels extremely far and deals 300/400/500 (+1.2 AD) physical damage plus magic damage equal to 10% of that target’s missing health (maximum 1000 damage to monsters.) His next shot becomes a burst shot. Heart Shot will pass over minions in its path, damaging them. Heart Shot makes an audio cue when striking an enemy. Yorn can hear this no matter how far away he is from the target. Heart Shot is visible on the mini map to all allies as it travels. Heart Shot has a rather low cool down, so can be used to support fighting allies while you farm or push. Yorn should most typically be built with standard marksman arcana. Great choices for this would be to get Blitz, Geurrilla, and Skewer. Yorn’s passive can help him break down tanks, especially those who have been stacking HP items. Buying items like Fafnir’s Talon will destroy even the most formidable health reserves when paired with Fierce Shot. Generally, however, tanks should be low priority targets compared to the opposing damage dealers and support. They are trying to draw Yorn’s fire and attacking them will leave Yorn open to assault. Yorn should have little problem dealing with warriors in a fight if he can keep his distance. He will need careful aim with Explosive Arrow and support from a tank in order to avoid getting burst down himself. Assassins are likely Yorn’s biggest threat. They are able to sweep in to remove his range advantage and possess high burst damage. His best hope in the case e can’t avoid confronting an assassin is to try and burst them down first. This won’t generally work out, so keep your distance. Mages are rather dangerous foes as well. Mages will have the damage to easily kill you along with control abilities that can leave you unable to doge. Their low defense makes them susceptible to your damage, however. Attack those that wander into range during team fights to eliminate early. While your damage can rip through a marksman’s low defense, they can do just the same to you. Be wary when fighting other marksmen. They should be among your first targets in a fight. Supports should be your first target if they come into range. Unfortunately, if the support is worth anything they will be staying well and away from you. Don’t recklessly pursue any, but kill supports whenever you have a chance.